Famine stalks the land - and woe! Conflicts, wars, revolts and strife. Your money then you cannot eat. When lightning fills the Northern Skies. When The Hooded Man shall ride. See the traitors flee and cower! This land shall fall by Fire and Flood! Our Folk to break the yoke of woe. Across the land the water lashes. And save this land by Holy War. 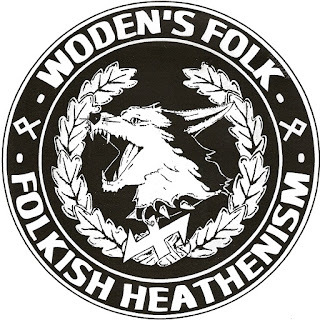 Woden's Folk is 18 years old on April 23rd 2016 and over this time we have struggled against all odds to revive the Ancient Religion of our Folk, and to prepare the way for the Coming of The Man to Come - The Avenging God. The last two years have not been good, either on a personal level or at times with our Folkish Movement. We had setbacks in the spring of 2014, and this year I have had so many personal problems that, though they have not deterred me, have set us back somewhat. But this is the strength of the Aryan Warrior who takes such setbacks and falls, and then gets up again without moaning and groaning, or for that matter blaming anyone else. The tide is turning and I feel now a great Wind of Change coming here in England - we have been knocked about, deprived of our identity, lost our culture and tradition, and the Forces of Evil have set out to destroy our Gene-Pool forever. The Great Flood has engulfed our lands, a flood not of the waters but of outlanders who have imported violence, crime and Global Terrorism, have been allowed into England and are still being allowed into England - even with the knowledge that these people will spread mayhem and terror. The blame lies in the hands of the 'White Traitors' and the Hidden Hand that controls them. When we started the English Resistance through a Torchlight Rite at Avebury and Wayland's Smithy we started the long struggle to take back our Ancient Sites of Albion - the White Island - from the so-called 'pagans', 'wiccans' and 'new-agers' who seemed to consider these sites belonged to them, and them alone. This was not a one-off and we shall resume this during 2016 - indeed, we shall reclaim these English Sites for Folkish Wodenism. The Flame of Freedom was lit in 2013 with these rites and the Spirit of Revolt activities of the previous years. These ancient sites are of vital importance for our struggle, since they lie on the system of Holy-Lines (Ley-Lines) around the land, and thus command great power. This is why our enemies have taken control of the Summer Sunwend at Stonehenge, Avebury and Glastonbury, as well as incursions into Wayland's Smithy, Rollright Stones and other important Holy Sites around England. We shall leave the political struggle on the streets of England to those brave young men and women who have taken up that struggle against overwhelming odds - ours is a religious struggle. But as you take back the streets of England, so shall we take back these Ancient and Holy Sites around rural England. Over the years we have had so many mystical and strange events at Wayland's Smithy that this place has obviously been 'awakened' by the years of use through Odinism and Folkish Wodenism. This land is sacred to us, not some 'Holy Land' in the Middle-East; our Ancestors worshipped the Gods at these places, places built by the Giants of ancient times - the Hyperborean Heroes. Their blood and their spirit still flows through the veins of those who feel the Call of the Blood through the Blood Memory. This is Albion - The White Island - The Isles of the Elven-Folk. So shall our land be Healed and Hael! Like the World-Tree - Yggdrasil - The White Tree - our Folk are battered and smashed, brought to the brink of destruction, yet with that knowledge that Lif and Lifthrasir (Life Renewed) dwell in the trunk of that Great Ash, that Noble Tree. The White Tree may be destroyed but the Seed of Life has been planted before that destruction. Life shall spring again and the Resurrection of the Arya. This is the challenge of our age, the struggle against the Forces of Destruction. This is a time of trials, of struggle and heartache, yet the Joy in Struggle comes from knowing we were born into these End-Times, born into this struggle, born to prepare the way for The Last Avatar. Ingwe led the Engel-Kin to these lands in ancient times, to the ancient lands of At-al-land; with the sinking of these lands Ingwe led our Folk eastwards and southwards in the 'Folk-Wanderings'. Ingwe led the Dragon-Ships around the world with the Sons of Ing. Fire is movement! Fire is action! We are the Folk of Ing and this is the Land of Ing. Ingwe is a very ancient god, a One-Eyed God just like Woden, the God of the Inga-Fire, of the Fire-Serpent, the Fire-Dragon. The Symbol of Ingwe is the White Dragon of the Engel-Kin. Ever burns the Fire of Ingwe amongst our Folk - the Inner Fire of the Gods. Hael to the Reborn Sun! Hael Light! Hael to the Rebirth of the Folk! Sheaf was sent by the Gods in a small boat, bearing a Sheaf of Corn, a Lighted Taper, and the Weapons of the Gods, landing on the Northern Island of Scandi ('The Shining Island'). There he was seen as a God and made King of the Engel-Kin. He brought culture, farming and fire to the Engel-Kin at the end of the Golden Age. He was the Divine Ancestor of the English Folk - he was Ingwe. Ingwe, The Stone and The Runes. This is the Stone of At-al-land which was thrown up from the centre of the Earth when the catastrophe sank At-al-land some 7,000 - 8,000 years ago. 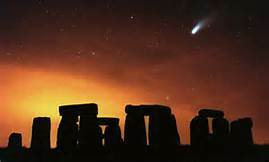 The dating of 8,000 years takes us back two cycles of the Hale-Bopp Comet, each cycle taking around 4,000 years, the dating which most scientists take to be right. This is so important to us, in view of the date of April 23rd 1998 when Woden's Folk was created - the rebirth of Folkish Wodenism in England. This Holy Stone is linked to the White Stone of Ing which holds the secret of the Inga-Fire (Kundalini-Fire) or Agni-Fire. This is the Stone of Origins and Destiny and is the stone linked to Sceaf-Ing who is the Divine Ancestor of the English Folk. This is the Fire of the White Dragon which will awaken the English Folk to their true destiny. The Inga-Fire is the Dragon's Fire or Serpent-Fire which awakens the Arya. Ingwe is the Divine Ancestor or God of our Folk, and he is associated with the Kan-Fire or Kon-Fire. If we notice the Ing-Rune it is a rune that ever repeats itself, opens up to further expansion, a Rune of Fire. If this rune is extended through one more X-cross it becomes twin Edel-Runes joined at the 'head' - the Divine Twins. This version is the Ken-Fusion or 'Fire-Fusion' which represents the Beacon Fire which itself is the Fire of Awakening. This is the fire that awakens our Folk. This is a rune of ever-expansion, a rune of movement and active-power. Ingwe represents this active-power and this expansion. Twin Edel-Runes joined at the head symbolise The Hooded Man and his incarnation on Earth as Wid-Ar the Avenger. This once more is an aspect of Ingwe - an archetype - which appears in the Age of Ing. England, whose ancient name was Albion, is the White Island but also the Island of the Elves - the 'Shining Ones'. Tolkien recognised that the English were closest to the Elves, and that they were the true holders of the Elven Mysteries in these islands. It is no coincidence that when Asbeorn found the Stone of At-al-land for me we afterwards did the Alfar Blot and one of the Elven-Race appeared to me on the Fairy Glen on the Moray Firth in Scotland. Ingwe is the 'Lord of the Elves' and 'High King of the Elven Race' - 'High King of the High Elves'. Indeed, this is the Age of Ing or the Age of Ingwe which is the 'Age of the Son', but which esoterically suggests the age in which the Kundalini-Serpent awakens in our Folk - awakens the Arya. The Seven Tribes of Ingwe came together in these islands - Isles of the Blest - in order to fulfill a great destiny, the destiny of the English Folk. Through the 'Anglo-Saxon' and the 'Viking' invasions this destiny was fulfilled, and today - at the End of Time - we have come to finally fulfill that destiny and the Divine Mission given to us by Woden. There are two types of people today, the Awakened Ones and those who are asleep and oblivious to their fate, like sheep waiting to become lamb chops, sheep to the slaughter. It is our Divine Mission to struggle, to struggle to awaken our Folk, to prepare the way for the Coming Man, and for the final appearance of the Einheriar - The Last Battalion. Ingwe represents the Kundalini-Fire or the Fire-Serpent and this is the secret contained in the runes on the White Stone of Ing - the 'Gift of Ing' is the Serpent-Fire (Kan-Fire) or the Kundalini-Fire which throbs through the veins of the English Folk and has taken them world-wide through the centuries, taken them as the sea-faring folk that they are - the Vikings. We have shown before how Sheaf-Ing goes back to the glorious Golden Age at the beginning of Time. Ingwe is a very ancient figure and one that still retains a memory here in England through the White Stone of Ing and through the legend of our 'Kin-Man' (Cuthman), despite the efforts of the Normans to destroy our English Identity through our Divine Ancestor. We have also shown how the Legend of Ingwe is not restricted to the English but occurs also in Scotland and in Ulster, amongst the Germanic Folk in these areas. There is also a very subtle and esoteric link between Ingwe and Woden, since the Gothic word for Ingwe is Iggws; in fact the 'gg' is sounded 'ng' in the Greek Tongue so here we have yet another esoteric connection. Ygg - Woden - Ing. This should be meditated upon. There is also an archetypal link between Ingwe and Hama (Heimdall) who are both Fire-Gods and whose roles are similar, though of a different archetypal nature. We should not try to intellectualise these ideas but let them freely flow as intuitive ideas. Different archetypes appear at different times of the Cosmic Cycles. Study this image very carefully and you will find the secrets of the Inga-Fire and the Necklace of the Brisingas - the Necklace of Freya. You will also find the Mask of the Wolf and thus the Secret of Fire. Woden is the Wolf-God who is the Great Initiator who awakens the Serpent-Fire. The Serpent-Fire is awakened in Bodn, rises through Son, and awakens fully in Odroerir, where Freya and Woden are united as One, and divided once more in order to effect the Resurrection of the Arya. The Serpent now has wings and flies as the Winged Serpent - White Dragon of Ingwe. This is the 'Fire-Dragon' - the awakened Kundalini. This is achieved through the power of the Kan-Rune - the Fire of the White Dragon. 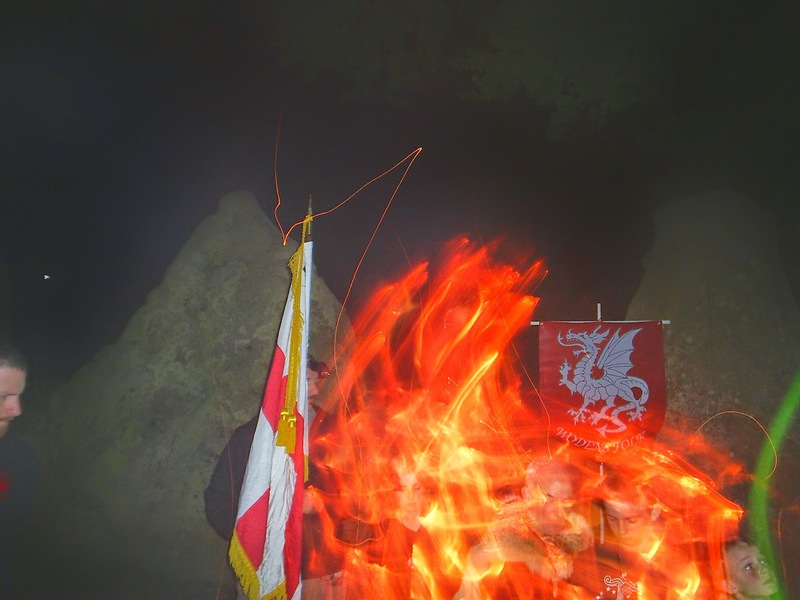 Now you can see how the Inga-Fire and the Fire of the White Dragon are one and the same, and how important it is to awaken the English Folk to their true destiny. Our enemies have seen how important the English Folk are and have thus set out to destroy us; whilst they have achieved their aim of halting an 'English Awakening' they have not foreseen the underlying and esoteric currents working against them. They can only work through matter and mind, through technology created by our Folk, reliant upon oil and electricity, through the physical means to control the minds of the masses - but the Folk-Spirit of our people is awakening as the White Dragon is awakening within that Folk-Spirit. Look towards the Spiritual Centre of our struggle, towards the Wrathful Wheel-Turner who will bring forth the Last Avatar - Wid-Ar the Avenger. He is the Silent God, for we have not spoken yet, but our time is coming and - 'The guilty shall tremble!' as it is written in The Hooded Man Prophecy. Know - Will - Dare - Keep Silent! The Cross of Ingwe & the Fire of the White Dragon! It is said that the Norse Gods raised the Sutherland Highlands, which suggests that the AEsir Gods were responsible for a great catastrophe that changed the whole of the Scottish Highlands, way back in the Mists of Time. The Scottish Highlands were split apart along the great fault-line that runs through the Moray Firth, an event that happened some 7,000 to 8,000 years ago with the sinking of At-al-land. 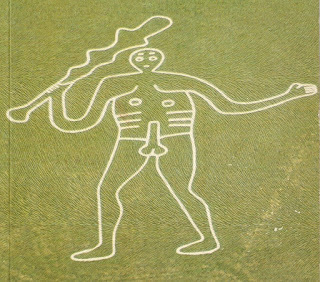 Solar-Phallic God of the Germanic Mannerbund. Once these islands were in the shape of an Ing-Rune, at least according to two Roman writers, and thus they held the shape of the god Ingwe, his rune-stave. The diamond-shape is that of the Diamond-Crystal from which the 33 runes of the Hidden Runes of At-al-land appeared, given to us by Woden in order to understand our origins and our destiny. Jera is the yearly Cycle of Ingwe, moving sunwise through the twelve months of the year. Isc is the 'sliding' movement upwards and downwards, the movement of the ancient Racial Lands, sinking and rising from the waters of the North Sea. Engulfed by the Frozen Ice, melting and rising again from the waters and the Great Flood. Ing is the Racial Homeland and the Race of Ingwe, the Race of Fire of the North, the Arya, the movement of our Folk from the Far North, towards the East and the South, returning to the North-West at the End of Time, towards the Setting Sun and the Final Battle. Daeg is the widdershins movement of Ing, backwards to Thule, backwards to the Golden Age, to the coming of Sheaf-Ing. The movement of the Folk from the East (Rising Sun) to the West (Setting Sun) - from the Morning Star to the Evening Star. Ingwe is of the Waene, the Folk of the Morning Star! As the Morning Star arises in the East at the Dawn-Time, so it sets as the Evening Star in the West at the End-Time. AEthel is the Racial Homelands, the sinking of the Racial Homelands, of At-al-land in the North-West, of the Isle of the Blest and the last post of the Aryan Mysteries. Heimdal reverses the movement of Ing, twisting backwards and widdershins, against the movement of Time, against the flow of Time, like the Salmon of Wisdom that swims upstream, against the Current of Time. Asc is the Upright Man, the First Man, the Inga-Man, the symbol of our Folk and the symbol of the Noble Man. This is the Tree of Iggdrasil, of Ingdrasil, the Tree of Woden, the Sacred Centre of which is Ing. Ing is the Inner Fire, the Core of Life, the Fire of Life - the sap in the plant, the Blood of the Folk. Quaert is the harmony of opposites, the stillness after the storm, the balance of Light and Darkness, the time of the Rising of At-al-land again, when the waters recede and the Racial Homeland rises once more from the seas of the North-West. Queart is the Inga-Fire, the Fire-Serpent, the movement of the Folk. Quaert is the Graal. Kaulca is the movement from Daeg (Day), the point of change, of tribal change and national change, the point of the Movement of the Hidden Sun (The Black Sun), the rays of which penetrate the Blood of the Folk, awakening the Blood-Memory. This is Saturn, freed from the Rings of Ice, freed from the chains that bind him to the Dark Forces, freed to return as the God of the Golden Age. Ihr is the Fire of Inga, the Inga-Fire, the symbol of Ing and Kan - the Fire-Serpent. The Diamond-Crystal poised above the Fire-Serpent, rising to the peak of Mount Me-Ru. Gar is Quaert, yet balanced by the Upright Stave, the Cosmic Axis, the Spear of Woden. The Spear enters the Graal (Quaert), and thus the Union of Opposites takes place, moving past, moving 'beyond', upwards towards the Black Sun and the way out of the Cycles of Time. There are four gods revealed in the Hidden Runes - Thunor, Balder, Heimdall and Tiw - but Woden remains as 'The Hidden God'. It is significant that Balder is found in this rune-row, since he is not found in the other rune-rows - he is the 'Resurrected God of the Golden Age', for he comes after the catastrophe, after the Ragnarok. Ing will sink, pulled down by the nith (Evil Forces), but the movement widdershins, backwards against the Flow of Time, will turn the tide, and the nid (need) will create a change, a turn, a return to the Sacred Centre, from whence a new Heildom (harmony of the Folk) will arise, and a new arising, a new 'Awakening', and the Spear plunged into the Graal by Parsifal - The Pure Fool - the World's Chosen - and the Rising of the Inga-Fire that will awaken the ashes into a new Flame of Freeedom. And the victory sign of Sighael, the Final Victory over the Dark Forces. The Lightning-Bolt that strikes fear into the enemies of Gods and Men. Most of the runes in the Hidden Rune-Row show movement whether this be upwards-downwards (12 runes) or cyclic (6); there are 11 rune-staves with the diamond Ing-Rune which clearly relates to Ingwe/Ing. It can be no coincidence that Ingwe if the God of the Inga-Fire and thus the God of Fire, of the Movement of Heat, of the Rising of the Serpent-Fire. Caan is the outward movement of this Fire, whereas AEuuas is the inward movement - the Inner Fire. Peorth is converted to Paertra, symbol of the upward-downward movement of Ratatosk, the Movement of the Fire-serpent. But at this time the movement is downwards (ALU), in order to spiritualise the Earth. The movement is downwards and inwards, moving into ourselves, moving towards the Ur-Centre, towards the Place of Origins. Only through a reversal of the symbolism can we move against the Flow of Time, break the Cycle of Time, and emerge, resurrected as The Immortals, as the Sun-Man. For inside this rune-stave is the Symbol of Life, of Lif and Lifthrasir, hidden within Iggdrasil, awaiting the Resurrection of the Arya, of Baldaeg the Sun-God. This may not be understood as yet, but it has been written down in the trust that there is one who can unravel these Mysteries, who can 'read between the lines' and see the Hidden Knowledge that these runes contain. There are clear links between various runes, such as Gaefu ('Gift') and Stahn ('Stone') both clearly linked to the 'Gift of Ing' - the Stone of Ing. The actual rune-staves I will not reveal as yet, not until their time has come. The 33 runes of the new row could be derived from ancient times and from the Lost Land of At-al-land, though since there are no less than eleven (one third) runes containing the Germanic Ing-Rune then we could also be looking at a new rune-row especially for the Age of Ing. Again, maybe both of these ideas have some truth. Tacitus stated that the area around Frisia, Holland, Denmark, Sweden etc. were the homelands of the Ingvaeones ('Friends of Ing'), and since these are the areas opposite to the lost lands then we can safely assume that the whole of the area around the North Sea, including what is today England, was the Land of Ingwe. The secret of the Stone of Ing is contained in the runic-sequence Gyfu ('Gift'), Ing ('Ing') and Ken ('Fire'). But the 'Gift of Ing' is the Kundalini-Fire! 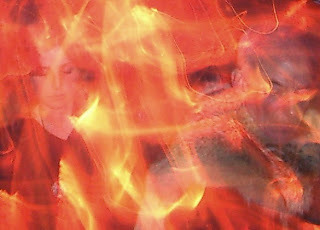 This is the Fire that burns within the AEthlinga (this is actually stated in the Old English Rune-Poem). The suffix 'ing' is always used for some kind of movement - do-ing, go-ing, walk-ing, hik-ing, mov-ing etc. etc. Ingwe's association with the element of Fire is underlined by the use of the term 'inglenook' for the area around the fireplace. The use of this term shows how ingrained in the Blood Memory is the god-hero Ingwe. When we consider that the name Ing stems from the Root ng which is one sound, but which today is broken into two separate sounds 'n' and 'g'. This 'broken' sense may reflect how the psyche of our Folk has lost its unity - the 'Broken Sword'. The English Ing-Rune is interesting in that it is made up of two 'Gyfu-Runes'; when we consider this in terms of the Greek Language the 'gg' is actually pronounced 'ng'. Hence why I link 'Igg' to 'Ing'. 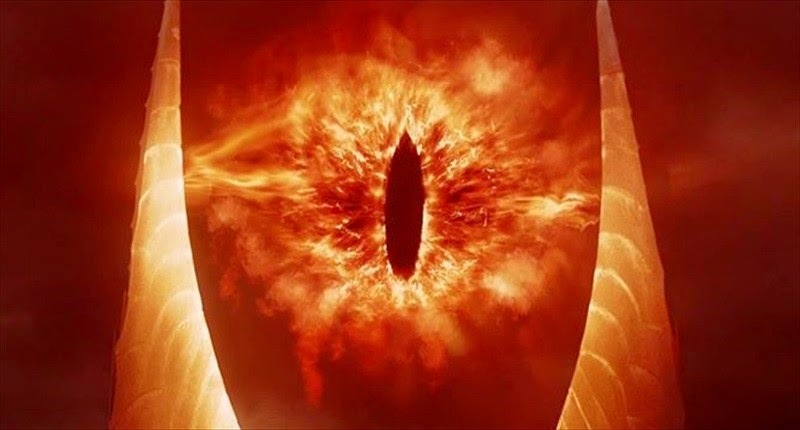 From the tales from Scotland and Ireland we find that the figures associated with the name 'Ing' are one-eyed, and thus Ing is an aspect of Woden in one sense, or maybe a more ancient form of Woden. Iggdrasil is the 'Sun-Dragon of Ing'. The Spirit of Ing guided the Sons of Ing across the waters to England, a process that took many centuries to fulfil. Under Hengest (Ing-Geist) and Horsa the Engel-Kin finally started the process of bringing together in these islands the 'Friends of Ingwe' together as the English Folk-Nation. In Wodenic Lore this refers to the Seven Swords of Wayland which are forged together into the English Nation - the Seventh Sword. In regard to the diamond-shape it is interesting to note the root of the word 'diamond' which is a corruption of 'adamant', from a Latin based word. The meaning is 'unconquerable' which, when we link this to Ingwe, is a very important concept to us. The diamond is indestructible too, which is an omen we should well consider. The English Ing-Rune is a spiral form, like the DNA Spiral, and is the Rune of the Blood-Memory. In the Old English Rune-Poem Ing is referred to as 'The Hero' (haele) and when we consider that hael can also mean 'omen' we can find a subtle link between these ideas. Indeed, the term hael refers to a particular type of 'hero' - the Hallowed One. The particular reference to the Heardingas in the Old English Rune-Poem is important, for this is the Haddinga-Tribe from which the last incarnation of HelgiH appears - Helgi, Prince of the Haddingas. Helgi Hundingsbane appears to herald the arrival of the Last Avatar - HelgiH the Heardinga. This obviously refers to the Resurrection of Ingwe in the Age of Ing. I have mentioned before that in the Merlin series on TV, though grossly distorted, the Sign of Ingwe appears as the symbol of the 'Old Religion' whose centre is the Isle of the Blest. Within the Ur-Glyphic Ing-Rune is the 'Seed of Life' which represents the 'life-renewed' that will take place in the Age of Ing. The importance of the Age of Ing cannot be underestimated, and this is part of the Woden Folk-Religion. If this is not fully recognised in our time it will be in the time to come. We are not the only ones to recognise the awakening of the Fire-Serpent in these times. This is the Gift of Ing. It is also important that the concept of the Priestesses of Woden is fully recognised, and that our women-folk step forward to lead the way in this era. This is important in view of the fact that some aspects of the Feminine Mysteries will be distorted by those who hold views opposite to the Racial Ideal that we uphold. Without this Racial Ideal the true Aryan Ideology will be subject to distortion and to eventual destruction. In Wulf's Prophecy we find that a Great Flood engulfs the South of England, though this has either the meaning of a future inundation by water or the 'Flood of Immigrants' that has already engulfed the South of England and created Chaos and Destruction as yet not recognised by the mass of people who have already started to suffer under the yoke of tyranny that has been responsible for this. This may yet refer to a coming catastrophe we are unable to avoid because the English failed to wake up in time. If so the Hale-Bopp Comet was the Harbinger of Doom (justice) prophesied to come in our own era. In which case we await the Coming of the Wild Hunter-God! There is a clear message here - either the English Folk awaken and unite as a front against the Forces of Darkness and Chaos, or the Great Cataclysm will take place, and will force our Folk to unite under the Sign of Ing. The solution is in the hands of those who are the leading-lights in the English Awakening - it is now down to you. For those who have stayed loyal to the Sons of Ing I would state that our task has just begun, and that a true 'English Movement' will arise, perhaps today as the 'Seed of Life' but tomorrow as the vehicle of the Last Avatar who will lead our Folk to victory in the Final Battle against the Dark Forces. We await the coming of The Hooded Man or He-Who-Returns. 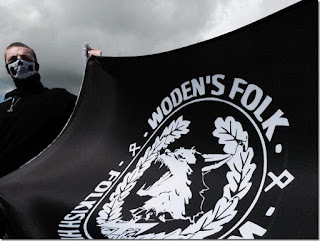 Miguel Serrano trusted in Woden's Folk and we shall not break that trust which we not only uphold but strive to continue through our struggle in England and the Northern Lands. We recognise Don Miguel Serrano as a Master as was Guido von List, and that Serrano continued the work of von List within the Armanen Initiates that have guided us throughout the ages. I have accepted the changes that appear in this post, despite the continuous reversions that I have made. I leave this now to 'Wyrd' that is beyond and above 'Google' or the 'World Wide Web' and leave this open to the Woden Initiates of the future who will see this as the Eternal Truth. The messages that appear here are for the future, and those that can reveal the Ancient Mysteries revealed here. Stay true to The Coming Man! A couple of miles east of the Long Man of Wilmington is the village of Polegate, a name which is said to mean 'Gate to the Pool' but which was originally Polgate, which suggests to me a link with the Germanic God, Pol. The later spelling 'Pole-gate' suggests the 'pole', i.e. the North Pole. The hill-figure faces to the North and the twin 'poles' suggest a doorway, thus the Gateway to the Pole. 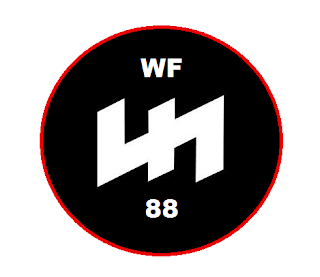 That this figure is that of Waendal does not invalidate what I am going to say here, for Waendal or Mundilfore is associated with the Sacred Centre, the World Mill, and is the father of Hama who incarnates upon Earth to bring the Social Order of Race to mankind. The God of Hyperborea was Apollo, according to the Greeks, who came to Greece in a Golden Chariot drawn by Swans. The name 'A-pol-lo' for a sun-god links him to Pol or Baldaeg of the Germanic Folk. Baldaeg is the Son of Woden and Frigg, and thus is a pure god-head, descended from a God and Goddess, whereas other Sons of Woden are the offspring of a God and a Jotun. This is because their role is that of gods of the Dark Age, and thus have to act within the confines of the Dark Age. Pol is the God of the Golden Age - of the Ur-Hyperborea. The Dark Rift at the centre of our Milky Way Galaxy is 'guarded' by the star Deneb in the Constellation of Cygnus the Swan; the Long Man is an earthly symbol of Cygnus the Swan. The Swan is the symbol of Hyperborea, and as I have stated Apollo drove a Golden Chariot drawn by swans. The Swan is the symbol of the Highest Initiation and appears upon both the Caduceus of Mercury and the Irminsul of the Saxons. Beyond these gates lies the Magical Elexir of Immortality, the nectar of infinite vision and wisdom - the Gateway to Thule. 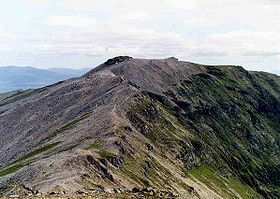 The peak of Mount Meru must lie in Capricorn, the North Gate, which is the Pineal Gland in mankind. The Sign of Capricorn is thus identified with the North, the Pole Star, and with Hyperborea. The Gateway of Time (Kalamukha) is the Gateway of Birth and the Gateway of the Devourer - Birth and Death. There is also here a link to the Divine Twins, since Zeus took the form of a swan to couple with Leda and father Castor and Pollox. Is it also a 'coincidence' that Hengest and Horsa have a sister named 'Swan' (Swana). Thus Hengest and Horsa are associated with the Swan; it is possible that Horsham (West Sussex) is Horsa's Ham. 1997 is within this time-frame. When I first mentioned the Hale-Bopp Comet and the Shamanic Initiation I stated that this area was a Time-Clock placed there by Aryan Initiates in ancient times. 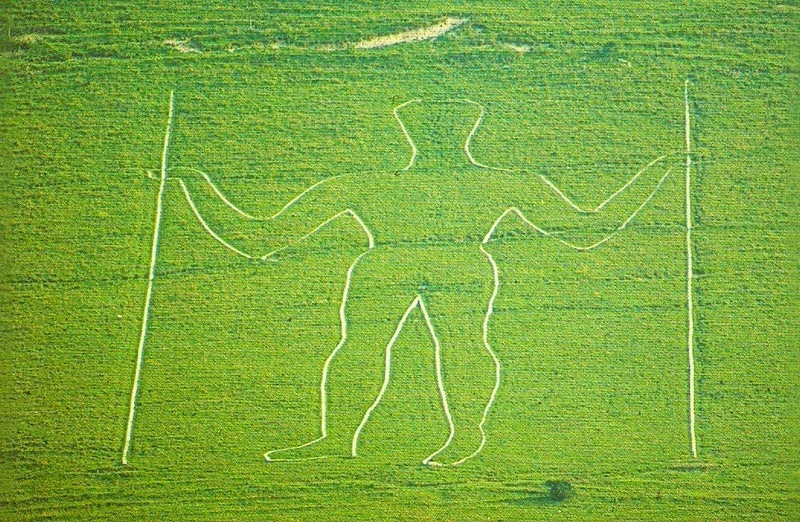 Even down to the Comet (the comet-shaped long-barrow named Hunter's Burgh), the White Horse, and the Windover Hill Long Barrow, all placed there to awaken a great force in 1997. 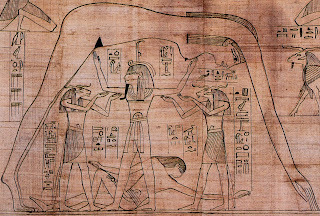 The 'Horn of Plenty' which featured in the Saga of Hale-Bopp; this is related to Capricorn and the 'Gateway to the Gods'. Next to this is a Solar 'G' symbol. Above the Solar 'G' symbol is a comet. On the right inside the arches is a Masonic Compass - or an Ing-Rune (Ur-Glyphic). Above this are Seven Stars. 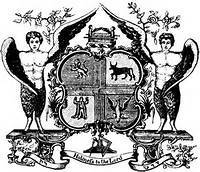 On the 'shield' are the 'Four Beasts' - A lion (Leo), an Eagle (Aquila), a Bull (Taurus) and a Man (Aquarius). The there is the Chessboard or 'Grid' which represents the Earth-Grid and its 'ley-lines' of power. Above the arches are the Son and Moon, and the arch has the signs of the Zodiac. This is an enlarged version showing clearly the Sign of Cancer at the top, the Son and the Moon, the Seven Stars, the Comet, the Horn of Plenty, and the Ing-Rune. In this version of the shield we see the Four Beasts (which represent the four signs of the zodiac related to the Precession of the Equinoxes) - Lion, Bull, Man and Eagle. 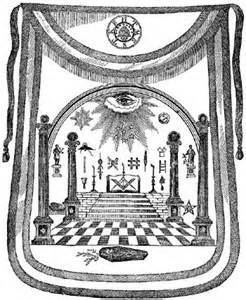 The symbolism in the version of the Royal Arch suggests a very ancient knowledge of these times, a knowledge perhaps not understood within modern masonry and its subversive elements. The 'tailed star' is obviously a comet and the Horn of Plenty, linked to the comet, with its appearance in my dream at the time of the Hale-Bopp Comet, seem too much of a coincidence. The 'arch' reminds me of the symbol used of the Goddess Nuit of the Egyptians whose 'womb' would lie around the top area of the 'arch' - the area of the Dark Rift of the Milky Way Galaxy. 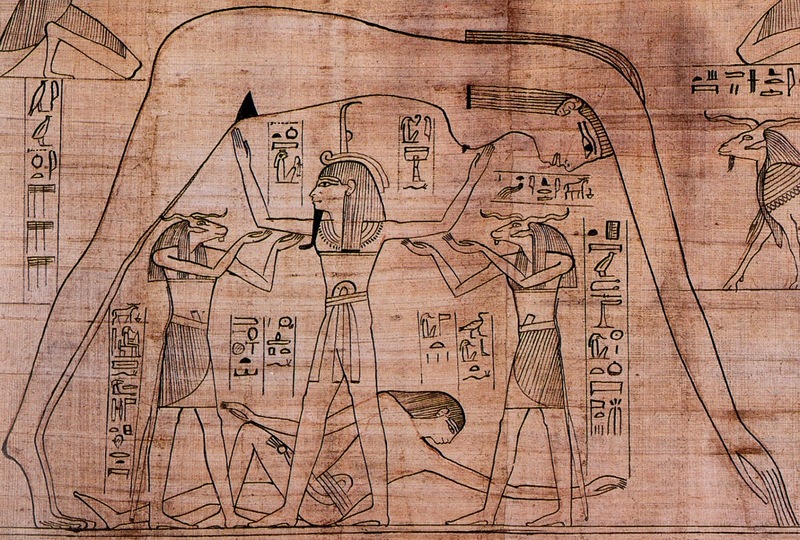 (The masons often use Egyptian symbolism as well as Jewish symbolism). 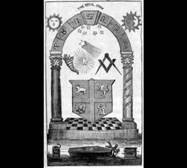 I will take a short look at the subversion involved in masonry later, but for now I would like to point out some very interesting ideas which masonry has, especially the Royal Arch Freemasonry. The 'arch', we are told, represents a doorway or gateway through which passage is gained to 'something beyond'. The archway represents a gateway of transition between the two worlds. This is exactly what I have outlined about the date 1997, the Hale-Bopp Comet and the Long Man of Wilmington. At the top of the gateway is the Keystone which is a wedge-shaped stone at the apex of the archway. This, according to Masonry, is related to Hiram Abif, the inventor of the Keystone. Hiram, I am led to believe is known as the 'Widow's Son' which is Horus or Parsifal. It is also likely that the story of Hiram Abif holds the secret of how the Aryan Mysteries were stolen in ancient times from Egypt - this is a story to be told later. Note - these last two paragraphs came to light only after I had written the first sections, when I looked through works on Masonry which told of these things. What seems very strange, and most likely a product of distortion, is that the 'Keystone' contains the Sign of Cancer which is at its highest northerly point at the Summer Sunwend. Since we are talking about the Northern Gateway then this should be Capricorn/Sagittarius and not Cancer. This area should be the Winter Sunwend. In the script about this, from the York Rite, it is said that the idea that Hiram is the inventor of the Keystone holds a symbolism now lost - in other words much of these secrets are not understood in modern Masonry. The symbol is our own Valknut which has within it the 'Triple Tau' which is said to be the nineteenth letter of the Greek Alphabet and which is a secret cypher for 'Hiram Abif' and for the 'Temple of Jerusalem'. In the British section of the Royal Arch there are Twelve Degrees, each one representing the Twelve Tribes of Israel. Much of the symbolism is Judaic in original and relates to the Old Testament, with some Egyptian stuff added - or maybe the reverse is the case. It is often said that Masonry originated in Egypt, and with the suggestion that the Aryan Mysteries were stolen by the slaying of the Egyptian Priest-King this makes some sense. What I suggest here is that these mysteries were once Aryan Mysteries and that the Hidden Hand of the Dark Forces stole these Ancient Mysteries and subverted them to their own ends. In other words they may hold some hidden truths, but that the symbolism was changed to suit an Evil Priesthood who sought to dominate the Earth through the use of Masonic Lodges. This letter 'G' or Solar 'G' could refer to 'God' and if we use English Gematria this adds to 26 which is the number of letters in the English Alphabet. Is this really a coincidence, that 'God' contains 'All' and is 'One'? But there were more than 26 letters originally, since to my memory we have lost the a-e and the o-e, which would make 28 letters. The original words 'encyclopedia' and 'orthopoedic' were written with an 'a-e' and 'o-e'. (We have also lost the 'th' and 'ng' which were originally joined but later split, but this seems to have happened earlier.) Why have these letters been dropped? Was this done deliberately in order to make the numbers of letters fit the number of 'God'? 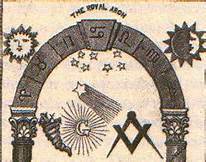 In the above version of the Royal Arch we see the 'All-Seeing Eye' at the top of the arch, and the symbolism of the chessboard. In relation to the chessboard I am reminded of the one related to the Star-Goddess and the links to the Long Man through Morgana - who seems to be the Star-Goddess. The 'coffin' is symbolic of death and resurrection. The chessboard is the Game of Life played out on the black and white squares of the board - symbolic also of Wyrd. In the Mason's Compass we can clearly see the Ing-Rune. The 'Keystone' is said to be related to the 'stone that the builders rejected' which seems an odd saying indeed. The 'masons' were 'builders' and maybe this tells us that this 'stone' was rejected by the Masons because they did not really understand the true meaning of this symbolism. The 'Keystone' should represent Capricorn-Sagittarius and the 'Gateway to the Gods', the key to the door into the Otherworld. Here it represents Cancer and not Capricorn - it has been deliberately switched from the Winter Sunstead to the Summer Sunstead. In regard to this there is a key phrase in the New Testament that tells us that 'Jesus' is waxing (i.e. the Winter Sunwend when he is said to have been born) whereas John the Baptist is waning (i.e. the Summer Sunwend when the light starts to wane). When I went through the Shamanic Initiation back in the spring of 1997 I was watching the TV with my family and could at one point see letters moving across the screen, letters which no-one else could see! Over and over I said that I could see 'subliminal' letters but no-one else could see them. They were very much like the above 'Occult Symbols' which are a Masonic Alphabet. These are obviously a Secret Code, simple but containing (once again) 26 letters like the normal English Alphabet. According to Jenkins the 'Sundoor at the world's end' is the Solar Gateway leading into the next world. This fits exactly with the 'Sun Symbolism' of the Royal Arch, and to the 'Gateway to the Gods' or the 'Gateway to Thule'. If the top of the arch is symbolic of the Pineal Gland then this is the 'Keystone' which is the 'North Gate'. The Twin-Pillars (of the arch and the Long Man) are thus the twin-channels connected to the rising of Kundalini (note the spiral on the right arch). 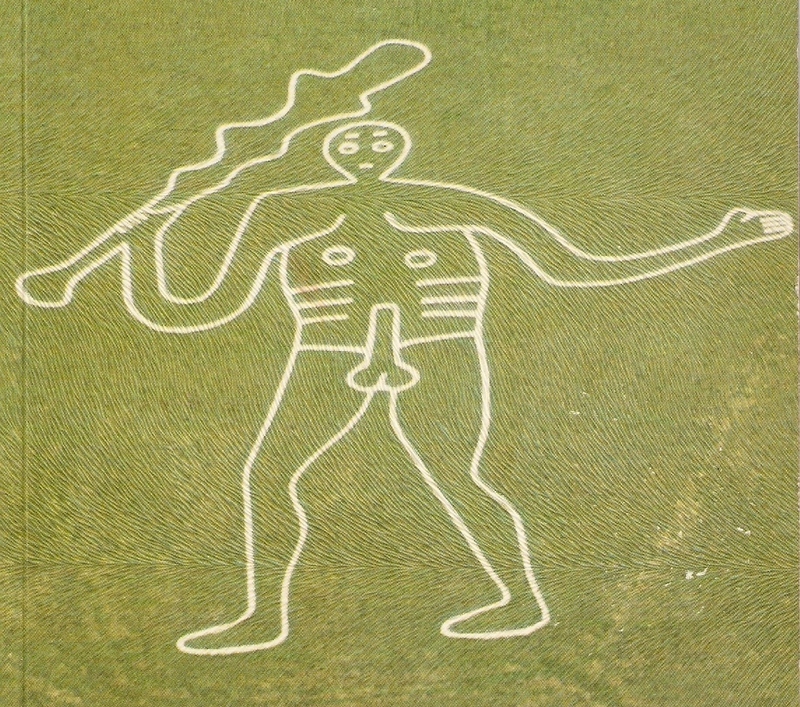 This also goes for the twin-spears on the 'Dancing Warriors', the 'Long Man', and the Finglesham Man. (The 'Dancing Warriors' on the Sutton Hoo Mask are thus linked to the Divine Twins. If we recognise that beyond the 'gates' lies the Elexir of Immortality (Amrita-Soma) then this is connected to the Apples of Immortality which are the Golden Apples of Idunn. We can also connect this area with Valhalla and the resurrection of the Initiated Warriors which must (as Miguel Serrano suggests) be the realm of the Goddess Idunn. She magically 'raises the Dead Heroes' (Einheriar) who partake in the Everlasting Battle, just as Hild does in one of the Norse Sagas. The Einheriar are the Initiated Warriors who take up this Everlasting Battle which cannot end until the End of Time. These must struggle against overwhelming odds, through life's tests and trials, through life's hard knocks and defeats, unable to do anything else but get up again and again to fight on. The end is not the aim - the struggle is the aim! Manu - The Man to Come - Miguel Serrano. This is the key to these Mysteries, for the resurrection of the Initiated Warriors is that of the Einheriar who incarnate as an Archetypal Myth and not as a 'man' or 'self'. This is the key to the Spiritual Lineage of the Graal Mysteries, for they are part of this Spiritual Lineage. We have been here before and we shall be here again. This is the secret of Valhalla and the Everlasting Battle. This symbol I found on the 'images' for the 'Mark of the Beast' and it seems to relate to a god named 'Nodens' found in the Gloucestershire area of England. This 'mark' represents the Four Beasts and the Precession of the Equinoxes at this particular time of the Cosmic Cycle. Whether 'Nodens' is 'Woden' we cannot tell, but there is a similarity in names. Certainly there is a similarity with Nudd, the Welsh word for 'Mist', but this is pronounced 'Neath' as in the name of the town in South Wales. This 'Mark of the Beast' has nothing to do with the '666' version in the bible, I may add, and the symbolism is very different. The 'beast' refers to the 'Four Beasts of the Apocalypse' which mark the key points of precession, using the Solar Zodiac. This I know to be the Mark of Woden placed upon the forehead of his Initiated Warriors; here he is the Horned One - the 'Great Initiator'. 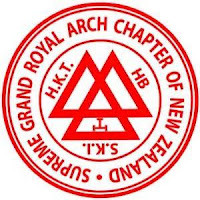 The Royal Arch symbolism seems clearly distorted when we consider that the Sign of Capricorn - the Horn of Plenty - appears with the 'Solar G' symbol and the Comet. Since I believe that the comet is the Hale-Bopp Comet which was seen in the Northern Skies then this should relate to the Northern Gateway. In this it does not, it relates to the Southern Gateway, Cancer and the Summer Sunwend. The Seven Stars shown in the drawing are definitely not the Great Bear, as their shape does not depict this obvious constellation, so it could thus be the Pleiades which forms a marker for the Galactic Anticentre in Cancer, i.e. the Southern Gateway. Devayana - 'Way of the Gods' - This is the period of the year from the Winter Sunwend to the Summer Sunwend, when the light forces are waxing stronger. It is the Solar Way. Petrayana - 'Way of the Ancestors - This is the period of the year from the Summer Sunwend to the Winter Sunwend, when the light forces are waning. It is the Lunar Way. The year 2012 seems to have been the time when the Sun was 'reborn' out of the Dark Rift at the Galactic Centre. This would seem to be the real relevance of this date. 1997 was the time when the Northern Gateway was opened and the link to the gods was made, when the Mysteries of HelgiH were revealed and the 'Time-Clock' around the Long Man opened this gateway through the appearance of the Hale-Bopp Comet. 1999 was the conception of the New Age - the Age of Ing. The 'Black Sun' (Solar Eclipse) 'brought back to life' the ancient god known as Ing, the 'King of the English'. In regard to the Seven Stars, the Great Bear or Plough are symbolic of the Polar Mythus, whereas the Pleiades is symbolic of the Solar Mythus which came much later when the Folk-Wanderings took our people ever southwards from the spreading Ice Age. These must be regarded as 'markers' to the gateways, and the Capricorn-Cancer line is the Solstice-Line marking the Galactic Centre-Anticentre. 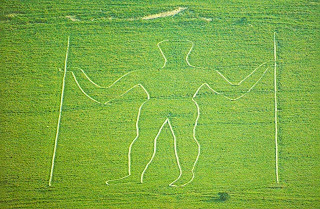 The mention of 'Morgana' and the 'Star-Goddess' shows that there are yet more mysteries related to the Long Man and to the Hale-Bopp Comet. We have taken this back to the time of At-al-land and even back to Hyperborea in the Far North. The Hyperborea - At-al-land was the North to North-West shift of Hyperborea to Atlantis in the ideas put forward by Julius Evola. This happened over a very long period of time. These mysteries have not all come to light yet but will do so over time. 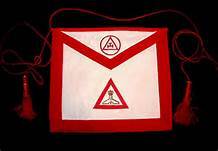 (*) The idea of the G-Mail symbol and the masonic sash comes from looking at 'Royal Arch Masonry' in the 'images' section online. This brings up the sash and the symbol, I have merely gone further into the name 'Google' and 'G-Mail'.